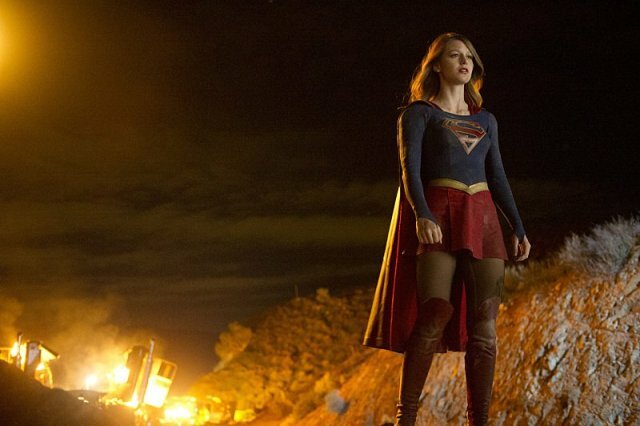 In a race against time to shine the mainstream spotlight on more female superheroes, Berlanti Productions and Warner Bros. Television have teamed up to create Supergirl, the first modern-day TV series featuring a superheroine. Initially sent to Earth in order to protect her younger cousin, Kal-El, moments before her home planet of Krypton was destroyed, Kara Zor-El never completed her mission. As her home planet was destroyed, a shock wave sent her space ship into the mysterious Phantom Zone, where she remained for years, until finally arriving on Earth as a 13 year old. With the assist of Superman, Kara Danvers was adopted by a family of scientists. Even though she has the same superpowers as her cousin, Kara (played by Melissa Benoist) tries to fit into society without making a scene. Working as an assistant to Cat Grant (Calista Flockhart), the most powerful media mogul in National City, Kara feels like she’s not living up to her potential, but when an airplane falls from the sky with engine failure that happens to have Kara’s sister on it, she jumps into action and never looks back. In this DC Television Universe — which functions separately from the DC Cinematic Universe, for some reason — Kara freely reveals her secret identity to quite a few people without really considering the consequences. Her coworker, Jimmy Olsen (make that James Olsen, portrayed by Mehcad Brooks) already knows about her alter ego, so naturally she instead reveals her secret to coworker Winn Schott (Jeremy Jordan), who helps develop a costume for her. Also, The Department of Extranormal Operations already knows about her and may be hiding elements of her past in order to capture her in the near future. While half of the series premiere unwraps the character’s mythology, the remainder of the episode preps for the rest of the season. Kara’s on-the-job training as Supergirl will take some time… she’s still a little rusty with her powers. Not only is she trying to get her feet wet (regarding her superpowers), but there’s already some distrust sown by her boss, the DEO and even her sister (who’s a member of the anti-superhero group). Future episodes promise to use the procedural format, where Kara must solve crimes in order to catch the criminals. After hiding her powers for 12 years, it’s time for her to finally become a hero. Origin stories can be tricky, at times, where information overload can lead to boring and uneventful stories. That’s not really the case here, where a brief confrontation with a low-level bad guy only increases the interest level for the main antagonist’s eventual arrival. Thirteen episodes have already been ordered for Season 1 and since the series was developed by the same production company, there may be future crossovers with CW’s The Flash and Arrow, but they most likely won’t happen for a few years, if at all. According to Berlanti, Superman may not make many appearances throughout the series, either, but the former superheroes of Dean Cain (Superman from Lois & Clark: The New Adventures of Superman) and Helen Slater (the title role in the 1984 Supergirl movie) will be featured prominently as Kara’s adoptive parents in future episodes. Strength: Finally, a strong female role model for kids & superhero fans alike. Weakness: A superhero procedural? That might work. WTF Moment: In an act of symmetry, Superman’s first feat was saving a falling plane, just like this version of Supergirl.